It’s where NASA, aerospace, and industry come together. If you are involved in any of the following industries or sectors, you can’t afford to miss SpaceCom 2018. Develop strong relationships across all NASA Centers and with industry leaders, increase ISS utilization, and exchange ideas for near and deep space exploration. Strategize near and deep space exploration advancements and meet with NASA leaders to form private-public partnerships. Startups, innovators, and investors can raise funds and leverage investments in an exponentially growing commercial space market. Form partnerships and collaborate on space initiatives with professionals from more than 30 countries. Harness Smart technology and services derived from space initiatives to improve the tools, machines, devices, and services we use every day here on Earth in the fields of energy, advanced manufacturing, medicine, agribusiness, and maritime. As every day goes by this new era of space commerce continues to unfold and affect many commercial industries, NASA, and other international space agencies and their partners, many branches of government both domestic and international, as well as individual people across the world. 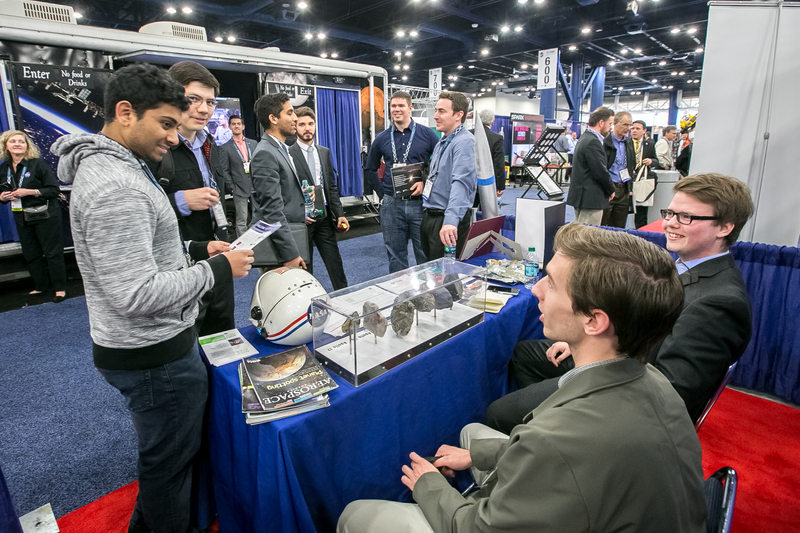 At SpaceCom 2018, you’ll have the unique opportunity to connect with others at a civilian conference and exposition. Here are some of the show highlights that are unique to SpaceCom. The SpaceCom conference is developed in conjunction with an Advisory Board made up of industry, academic, and government leaders, chaired by KBRwyle Senior Vice President, Vernon McDonald. The 2018 program focuses on in-depth education, interactive exchanges, and fostering connections to help attendees explore new markets, improve profits, and close contracts. Learn from the visionaries and innovators in your industry. Read descriptions and view the agenda. SpaceCom 2018’s show floor and exposition is packed with content, products and premium engagement opportunities that will help you capitalize on the commercialization of space to accelerate growth and profitability. With thousands of services and products across 24,000 square feet, you won’t want to miss a minute. Read more about exposition, see what products will be on display, and view the floor plan.